installed. Sparkman/Stevens like design. Interior well designed with handsome saloon. Sleeps 6. Located in West Granby, CT, USA. My father spent about thirty years building it. He is no longer with us. Tools may be available to come with it. The major part of the hull is finished but the keel still needs to be finished. He was going to fill it with lead. dimensions I'm planning on getting dimensions and pictures. My mother thinks its 18 feet wide. I watched him work on switchboards so some electrical work may have been done.. He was working on the nice woodworking inside. It has a dingy holder in the back. Hull is partially painted, white with a dark blue stripe. If you have questions, just ask. He was an experienced boater. He had a 37 footer sailing for a number of years. Hello EReluga and welcome to the forum. Sorry to hear about your father. 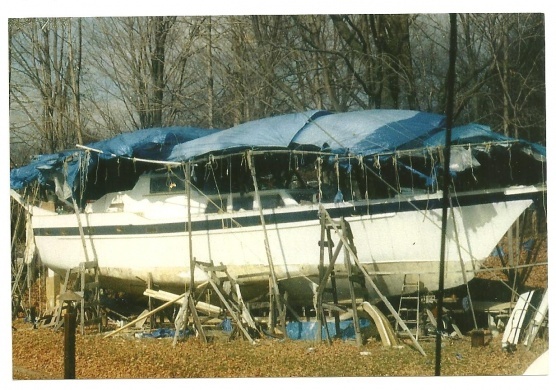 There have been similar situations on this forum that found a home for an unfinished boat like yours. Some additional information would help a lot. Most important, what material is the boat made of, fiberglass, wood, steel? Photos would help a lot. If you have trouble posting the photos someone will certainly help. Ok Skip of skipmac, how do I add information to my for sale post? Thank you. I do have more information as you asked. If I can add it here the boat is a plywood structure with 3-7 layers of fiberglass over it. My fathers first boat sailed to Maine and back, to Marthas Vineyard also. My father emersed himself in this 53' foot one. He went to boat shows. Also he made a 14 footer where he sold plans for it because of a special laminating process. It was in Popular Science Magazine or popular Mechanics. In contacting me (boat is at my mothers and she asks about a land address to contact you. Thanks in advance. I was told it has minimum plumbing. Please bare with me on pictures. I will try to get some as soon as I can. Thanks very much. As far as I know, you cannot add to to a post yourself but you can make another post with more information. Also, just to be clear, I already have a boat that I'm working on so not interested personally. Just trying to give you some guidance on information an interested buyer might want. The value will depend a great deal on how complete and what parts are included. You don't mention mast or sails. If these are not included then the value will be much less. Other significant details. Is the engine installation complete or nearly so, all the exhaust, cooling water lines, wiring, battery connections installed? You mention not much plumbing is installed. What about the boat electrical system? Are there lights, switches, a main electric panel installed? OK, update: The boat does have a mast. Also, I do have a picture. I do not know how to post it here but I'd be happy to email it. If someone knows how to post it here, I have it in JPEG format on my computer. Go to your EReluga profile and look on the right for "Albums". There you can upload photos. Good luck...Can't wait to see your boat. Thank you Lou. I went to my profile. I clicked add album. Then what is the next step? and if that doesn't work....let your kids do it.... :-) they are much better than we are. That's why we had always had the same phone as the girls... they could teach us. lol! Ok, thank you Lou. I uploaded the picture. It is on my album, now. To view it, you click on EReluga profile name then will see Albums to the right. Click on the picture once, then again and you can see it fully. If you know anyone who would like an unfinished boat, its for sale; please send them my way. Thanks!!! Update: We found a boom for the boat, under construction. Thank you for doing that GT. Ketch. Boat does have a mast. 2 masts? Found a boom. 2 booms? What is the price for this work in progress? Sorry about your dad. Wish he could have sailed her. 30 years is a long time to devote to something. Hi Gary. The ketch boat does have one mast and a boom that was being built. Since you ask about the price, make an offer. I hope you know that you would need to transport it out of there. Thanks for your thoughts on my dad. He would have loved to sail it. And yes he did put a lot of time into it.